Good access to Skytree town and Asakusa area! 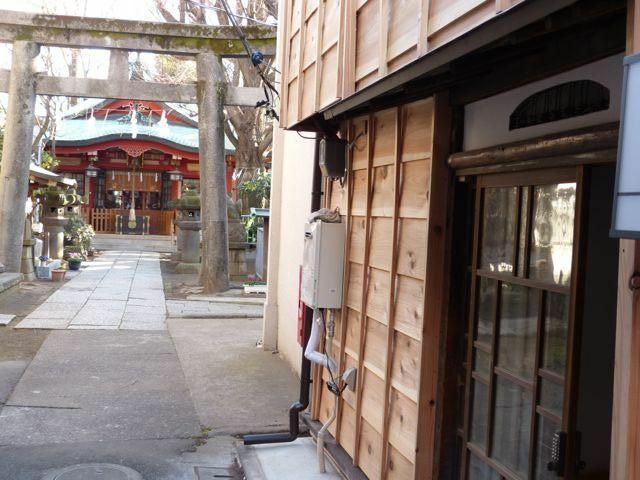 A 65 year old traditional Japanese townhouse located in busy downtown, Mukojima, Tokyo. The house belongs to my husband who spent his childhood there. We are university professors, and the house was too small and old for us to live with our three children and lots of books, so we have never lived there. After 30 years, I found it quite cool as it has not changed into western style house, which is now rare to find in Tokyo. The house was renovated nicely remaining its original taste. There are two bedrooms; one with a double bed and the other with two singles. The bedrooms on the second floor are floored with tatami mats. There are small but cozy living space and a kitchenette in the first floor. Bathroom with a bathtub and shower head. You will find the 'washlet' in WC. Since the house was built right after WWII, everything is made small according to the Japanese peoples frame at that time. If you are way taller than 6 feet, you may find it a bit close and uneasy. I am a retired professor who took her degree from Columbia university in NYC long time ago. Traditional outlook and modern equipments. Convenient to get to Akihabara, Ginza, Asakusa, Shibuya, Shinjuku, or even to Nikko. Bus stop right near the house and get to Asakusa by 10 mins. Less than 10 minutes walk to two major train stations. Though it is located close to Asakusa, the major tourists attraction in Tokyo, Mukojima area is not polluted with commercial tourism. There is a famous Japanese style 'tea house restaurant' where you can see and enjoy Geisha performance with reasonable price. independent WC and bathroom with bathtub connected by a dressing space. Mukojima used to be a fancy hiking spot for Japanese people in Samurai era. Now it is a residential area packed with row houses, small shops, eaterlies and some remaining buildings from the past. Each room is equipped with an air conditioner/heater. There is high speed Wifi at the house. ours is the tiniest living room! single IH cooking heater. Strong enough to cook anything. our kitchen is not so spacious. It's a part of living room in the first floor. Small sink and IH cooking heater. Some English books in the main bedroom. Our vacation rental, the Sumire House is a renovated Japanese house which was built right after WWⅡ. You may be surprised to know that one whole family of five used to live in the house. It is a remaining memorial of poor, devastated post war Japan. Now it's fully renovated but we dared to leave many parts of the house as they were. We hope you enjoy the time warp here. From Sumire House you can easily visit many interesting spots in Tokyo such as Asakusa, Akihabara, Ginza, Shinjuku, Shibuya, or Tsukiji fish market using public transportation. It was nice to spend a few days in this lovely place and the extra welcome at the train station was definitely a plus! All of us enjoyed staying at Sumida House. There was a very informative guide and any questions were quickly answered by the hosts. The bedrooms had plenty of room and the beds were comfortable. The only reason for four stars instead of five is there is a very busy road close by and it was quite loud making sleeping difficult. However this would not keep me from staying again but I would bring ear plugs next time. Thank you very much for your staying at our place. Sorry about your sleeping. Did Kelly have a good start with her Japanese University? I assume you folks went over to Sumida river to walk along under its famous Sakura blossoms in bloom. Sakura and the river has been well-known as authentic beauty of old Japan and wish good photos were taken with the camera. Great location, great host. If we come back to Tokyo, we will be staying here. Danny, glad to know you folks enjoyed the restaurant. Did you enjoy walking around our area to feel its own unique atmosphere? Do please come back to Mukojima. Thank you very much for your staying at our place. Comfy house in convenient location! Stayed here in summer of 2018 prior to this visit and was pleased to find it was consistently in good shape! Very convenient location next to two stations and several convenience stores and a supermarkey nearby. House was the perfect size for our party of three, but if you’re a family that’s a little bigger might be a tight fit. Beds are great, bathroom is clean and the aesthetic is very relaxing. Would always recommend! Thank you very much for your 2nd stay at our place. We appreciate your nice comment so people will be encouraged to visit our place. We had been to Tokyo before and always stayed in the tourist areas on the west side of the river. This time we were interested in experiencing life in a Tokyo neighborhood and we found that at Sumire House. The house is old (immediate post-war) but well maintained and retains many traditional features. (Even if you’re average height you need to watch your head in places.) At the same time it has a modernized bathroom, washer/dryer, good wifi, and tv with many channels including a few in English. We enjoyed exploring the neighborhood, which had many small shops and restaurants. Like other reviewers we encountered many non-English speakers, but we found people were very nice and we were able to get by with our limited Japanese. (We avoided places where it looked like language would be an issue if they were very busy.). Although a little off the beaten path, the house is about a 10 minute walk to two train stations that provide good access to the rest of Tokyo. The owners and property manager were very nice and responsive. This house isn’t for everybody, but if you’re interested in experiencing Tokyo beyond the tourist zone we highly recommend it. I hope this trip has added some new taste to your memory about Tokyo. We loved our stay at this sweet little house in a traditional neighborhood next to a beautiful Shinto Shrine. Despite being older, it's very well equipped with a large bathroom by local standards, a nicely stocked kitchen with everything you need to cook and store food, and comfortable beds! It's convenient for seeing historic parts of the Sumida ward including Asakusa and many museums, situated close to a beautiful pedestrian and cyclist only bridge crossing the Sumida river. The very modern Skytree is also close by; along with restaurants of all kinds. The Hikifune and Oshiage(Skytree) train stations aren't too far, but expect to walk a little ways and plan your days. We had a great time and would highly recommend Sumire House! I would like to thank you for your giving us the nice comments. So glad to know that your stay in Sumire House was suitable to move around to expand your trip. How about having a day trip to Nikko, where one of the most famous shinto shrines in Japan is located? That was built for a tomb for Yeyasu Tokugawa, who started Tokugawa shogunate in 1603. From Sumire House, it is very easy to get to Nikko. Kyoto enjoyed culture of court nobles with showy buildings and gorgeous eating/clothing habit while Nikko, the place where the top samurai is laid, has different taste. The regular number of guests is four at the Sumire House. However, one extra person can stay if s/he can sleep on Futon. In that case we charge $20 for the extra person a day.